Conrad Murray defense in death of Jackson "Michael broke the syringe". There has been extensive and seemingly non ending litigation involving the estate of Michael Jackson. Many disputes and contests ranging from children who claim he was their father, woman who claimed to be married or have children with them, disputes regarding licensing deals or various creditor claims among many others. The most recent litigation regarding the death of Michael Jackson is for a change out of the probate court or even civil court with a wrongful death case to be pursued as well. Today the litigation regarding the death of Michael Jackson is the manslaughter case against his personal doctor Conrad Murray who has been accused of being grossly negligent in causing his death is seeking to defend on the grounds that it was Michael who gave himself the lethal amount of propofol. His legal team is arguing to get a first generation finger print on the syringe that rolled under his bed. Like the OJ Simpson case regardless of what happens in the criminal trial there will very likely be a wrongful death lawsuit brought. The criminal case will have a standard of proof of beyond a reasonable doubt and be to determine guilt or innoncence and have jail time involved while the wrongful death case will be a civil case regarding whether there is responsibility for the death and that only needs a more likely than not standard so it is easier to prove. One interesting element in the wrongful death case would be damages from a financial perspective given that the estate made more money after his death than he ever made while alive. Unfortunately Willis and everyone else would know what a real estate appraiser was talking about if they heard of the late Gary Coleman actor from Different Strokes former home in Utah having fallen from the $320,000 price he paid for it and at his death he or his estate had owed $325,000 which is now in foreclosure and being listed at $225,000. The court appointed probate administrator wrote that "belongings in the house are disorganized and in disarray." As it is a small town in Utah it is a good value at $48 per square foot for over 4700 square feet and on more than a quarter of an acre of land and is a 3 bedroom 3 bath now with a listing price of $225,000. Showing the importance of location to real estate again obviously this would be several times the price if it were located in New York or the Los Angeles area many other film and tv stars live. As Sheree Curry reports the Forbes family is seeking to sell a London area mansion for $19+ million that was bought by the late Malcom Forbes in the 1970's and that he put $750,000 into fixing it up for the company to entertain and his to spend around 12 days a year there. Over the years the property has entertained Princes and other royalty, Presidents and other high profile celebrities. 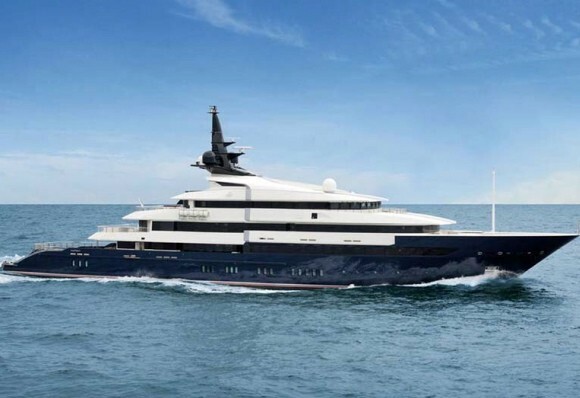 It is now being offered for over $19 million. While the economy is terrible around the world very high end real estate is doing far better than other segments of the market so they will likely be able to add some further liquidity to their estate and receive a nice capital gain. Now that the estate tax exemption has been brought back to just a $5 million dollar exemption or $10m with portability to the spouse they would still be subject to that and need to have funds available should others in the family pass on. True that the very wealthy live very differently than the rest of society. To have bought a 300+ year old mansion and put that much money into fixing it up while intending to stay there twelve days a year is typically not an opportunity most buyers have. Irviving Pickard is seeking $1 Billion dollars to be returned from "false profits" from the Madoff ponzi scheme in which money was taken out more money than had been invested. He had filed a lawsuit for that but was given until Friday to amend and is now going to add charities that Wilpon charity controls. Today he added the charitable funds and is pursuing millions further from them. See Trustee Targets Wilpon Charites. The prosecutors are seeking to reverse the ruling by the judge that the charges be thrown out regarding Howard K Stern her boyfriend and lawyer and subsequently the personal representative of her estate who was charged with 7 crimes in connection with helping her get prescription medication under various false names. The jury failed to convict on five counts and the judge tossed out two others claiming not enough proof. See CNN video Is Howard J. Stern back in hot water. The Estate Litigation of her ex husband still continues as well over 15 years after her ex husband Howard J Marshall died. Yahoo has a video showing this South Florida Mansion. It is a $60 Million home on a private island near Miami. On ABC News they interviewed the developers Schlomi Alexender and Felix Cohen who have put $30 million into buying the land and developing or improving the home. It has 30,000 square feet home on 2 acres of property. 10 Bedroom. Five kitchens. A shower that 9 people can all fit in. Huge closets. Lots of cool stuff including great views of the water right behind. Sand was flown in for the beach right behind the home. Insurance cost $1 million a year though and they estimated someone would need to have around $500 million to buy and own the home. It is for a person who is seeking to collect homes. People on Lebron James and Alex Rodriguez had looked at it and decided they could not afford it. The video mentions there are just over a 1000 billionaires and they are seeking to entice one of them to buy the home. Celebrity Multi Million dollar Real Estate purchases or sales. AOL just reported on recent celebrity real estate transactions. Among them Actress Reese Witherspoon bought a $7 million dollar home from Steven Segal 6200 square feet in Brentwood California. John Mayer became the latest celeb to realize that even celebrities have to sell their real estate for less than they paid as he listed his LA home for over a million but around half a million less than he bought it for in June of 2006 so he will have a substantial loss but already has a $2.17 million dollar home to go to. In Florida real estate news Michael Jordan has bought a 28,000 square foot home in Jupiter Florida. Including the main mansion, a guest house, a guard house area. Dwayne Wade seems to have worked out the best deal of them all having bought his 13,000 square foot Miami Beach area home for more than $ 7 million below the asking price. To see the article and pictures of the homes click here. Lebron James bought multi million dollar home in Florida. As Paul Owens of the Sun Sentinel reported today Lebron James has recently bought a $9 million dollar home in Coconut Creek Florida. When he first joined the Miami Heat it was reported he had bought another multi million dollar home. His mansion is the least expensive of the 3 Miami Heat stars. His team mates both have bought more costly homes with Chris Bosh having spent $12.5 million and Dwayne Wade spending $10.6 million on their Florida real estate to live at. Nearly Billion dollars in clothing and related item company created by actress. As a Yahoo blog written by Erin Carlson on December 7 points out Jessica Simpson has created a large multi million dollar estate more as a business person than as a singer or actor. The article points out that her holiday album is # 123 on the charts and her last movie Blonde Ambition grossed under $7,000 but Jessica Simpson Inc including her endorsed perfumes, clothing and other products is worth around $750 million and she is worth $100 million personally. Woman's Wear Daily a magazine reports that her empire of clothing and other products for woman is far more valuable than many other celebrities with wider fame. Impressive for someone to create that much wealth especially when it is something other than their primary talent or what they are famous for. With articles and others referring to her as a dumb blonde it appears she gets the last laugh as a near billion dollar successful business woman. Superbowl tickets and Jet service to game included in sale of Florida home. As Mai Ling mentions in a December 7 2010 real estate blog as part of MSN former Miami Heat player Shawn Marion is offering to give Jet Service for 4 along with Super Bowl tickets to whoever buys his $2m dollar home in Coral Gables Florida. During the Michael Jackson probate there has been plenty of probate litigation and estate disputes with various people claiming improper conduct or to be owed money from the estate. Joe Jackson has brought a number of claims in the estate despite Michael having very clearly and intentionally not provided anything for him. His wife Katherine who is the primary beneficiary during her lifetime (along with the children) has allowed his silly schemes to seek to profit off the death of their son and has continually gifting him money from the estate even as the personal representatives have objected to his getting an allowance which he claims he was entitled to. However this generosity did not stop Joe from publicly blaming his wife (they are separated but still married and in touch) from saying that he thought Jackson looked frail so he had continually told her to go visit with Michael and cheer him up. She said she did not want to invade his privacy so she did not continually stop by where Michael was and he is now blaming that for his death. It will be interesting if this is enough for her to finally stop giving him money from the estate which Michael did not want him to have. The dispute over his claim for an allowance still will need to be heard from the probate court with the personal representatives who are running the estate opposing it. 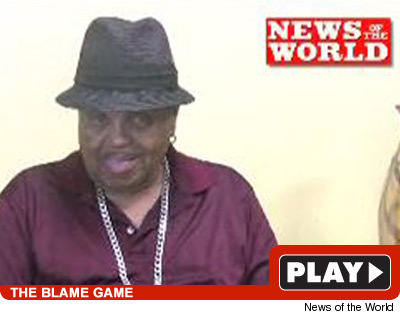 TMZ relayed the information and video from News of the World see June 13, 2010 Joe Jackson blames Kathrine for Michael's death.